Well, according to TrekMovie.com, who admittedly has a pretty good track record with Trek movie rumors. The title matches the volume-number-less installment of Star Trek Into Darkness, but seems to confirms the new Enterprise crew will finally be going on its five-year mission to explore strange new worlds, etc. [W]e just want to take it forward with the spirit of the TV show. And it’s a story about frontierism and adventure and optimism and fun, and that’s where we want to take it, you know. Where no man has gone before – where no one has gone before, sensibly corrected for a slighter more enlightened generation. But yeah, that’s the mood at the moment. 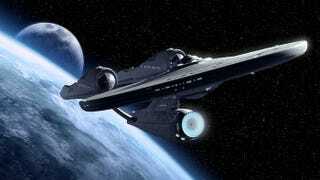 I really like the idea of nu-Trek actually exploring space, but man, Into Darkness left such a bad taste in my mouth. On the plus side, I guess that just leaves more room for improvement, right?